Now Tony is in middle age. He’s had a career and a single marriage, a calm divorce. He’s certainly never tried to hurt anybody. Memory, though, is imperfect. It can always throw up surprises, as a lawyer’s letter is about to prove. The writing is beautiful. The words poured off the page seamlessly, flowing and rippling like a gentle stream. In many ways I can understand why this book won the Man Booker Prize in 2011. Tony is forced to recall events of his younger days (school and university) and it is interesting how he selectively remember events. Then realises that he may have been remembering them wrongly, emphasising different aspects. Something that we probably all do. Making some snap seconds seem more important than they were/are, which we obsess over. (A theme in The Museum of Innocence by Orhan Pamuk, one of my favourite books). There was no hurried or rushed page turning and I took my time reading this, happy to float along the stream. I didn't think the plot was overly exciting or thrilling; the main character, Tony, was a content divorcee and was a 'nice' man. But, the lack of a thrilling plot doesn't even matter. I still felt a massive lump in my chest at the ending. (I was blown away by the sad ending actually and totally surprised by it.) This is in no way a feel-good book (I am ready for one of those), but it is a wonderful story written by a wonderful story teller. I would highly recommend it. On a side note, the edges of all the pages are unusually black and makes out like it is blurring onto the cover design. Interesting. Why? Is it because the book is quite dark and depressing? Or do you think it is just to be different? I am thinking about getting a Kindle...but I think I would miss holding a book, looking at its cover, being enticed by the book to read it. This was my last book from my recent package to Nairobi. I don't really feel like I can justify buying anything at the moment (as the cost of moving is way beyond my means as it is! )-but I just don't feel like reading any of the ones on my shelf at the moment. Are you reading anything good at the moment? This book sounds really interesting. I am sure I would like it so I'll put it on my list! Thank you! I'm with Katrin -- sounds really interesting! Love the way you described it too. Sometimes books with no thrilling parts can be hard to stick with, but it sounds like you care enough to follow along anyway. I loved this book. 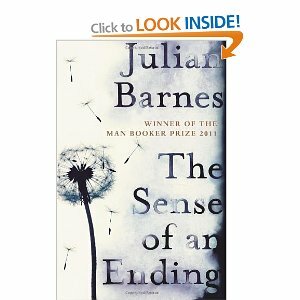 I'm a Barnes fan and just love his sparse writing style. So simple and yet so profound. I've found you via POTM! I lived in Cape Town for a while duirng my twenties. There really is something very special about Mama Africa. wish i had more time to read book would love to read this one! glad you found me zigsma! I read this recently. I do agree with you about the superior writing style. But overall it left me a bit cold, a bit "oh - is that it?" Maybe I'm too much of a cynic, but I didn't like the characters enough to care very much about what happened to them. Have you tried Cloud Atlas? Another book with rave reviews that I just failed to get into. Or maybe its just me! i tried and never finished it. I thought perhaps it was my mood, but have never been tempted to pick it up again.